Coastal flood warning in effect from Friday 9 a.m. until Sunday 3 a.m.
BOSTON – Thursday, March 1, 2018 – Mayor Martin J. Walsh today announced safety and flood protection tips for residents ahead of the anticipated coastal storm and flooding that is expected to begin on Friday. The coastal storm will bring heavy snowfall and sustained winds of 20 to 40 miles per hour (MPH), with gusts up to 65 MPH. Strongest winds will be Friday afternoon and evening. During Friday night, rain may switch to snow, will potential snow accumulation reaching 2-3 inches. Coastal Flood Warning in effect from Friday 9 p.m. until Sunday 3 a.m.
Areal Flood Watch in effect from Friday 7 a.m. until Saturday 7 a.m.
High Wind Warning in effect from Friday 10 a.m. until Saturday 10 a.m.
All city agencies and services, including Boston Public Schools, will be operating under normal business hours tomorrow. As a precautionary matter, Mayor Walsh shared the general safety tips below, as well as information on what to do both before and after a flood event. 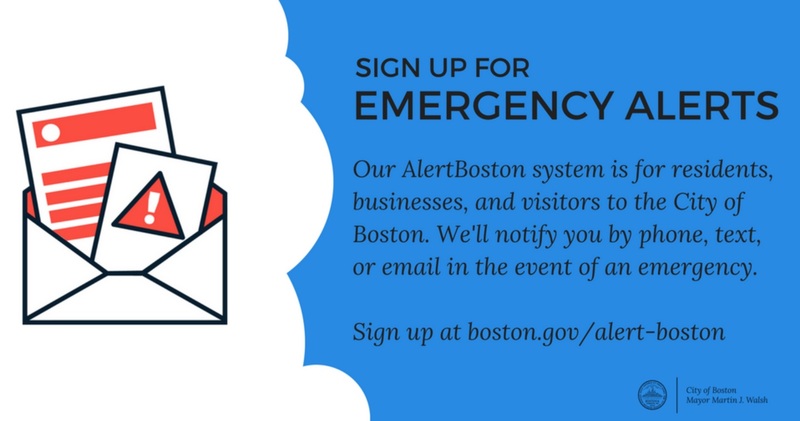 Sign up for emergency notifications through AlertBoston. Know your zone! Know your evacuation zone and route and be prepared to evacuate if directed by public officials. Similarly, find out how vulnerable your home is to flooding by determining the elevation of your property. If your home is in a flood-prone area, contact the National Flood Insurance program to learn what mitigation measures you can take in advance. Put together a disaster supply kit, including a flashlight, batteries, first aid supplies, copies of critical information, and non-perishable food items. Tie down or bring in outdoor objects (outdoor furniture, trash receptacles, etc.) that could be swept away or damaged during flooding. Secure loose rain gutters and downspouts and clear any clogged areas or debris to prevent water damage. Elevate items stored in your basement to prevent damage. If you have a sump pump, check that it is working. Consider clearing street catch basins to prevent or reduce street flooding. Consider parking your vehicle away from the harbor, streams or rivers, especially during threatening weather conditions. Follow any directives to turn off utilities. If you’re advised to switch off the main power source to your home, flip each breaker and THEN turn off the main breaker. You may also need to shut off the main valve for your home’s gas and water service. If you are evacuated, return home only when authorities have indicated it is safe. Do not go near any downed power lines, especially if there is standing water nearby. Avoid walking, bicycling or driving through flood waters, and allow for extra travel time. If your home experienced flooding, keep the power off until an electrician has inspected your system for safety. Have an electrician inspect electrical appliances that have been wet and do not turn on or plug in appliances unless an electrician tells you it is safe. A trained professional may be able to recondition some devices while others will require replacement. Photograph damage to your property to assist in filing an insurance claim. Take necessary measures to prevent further damage to private property immediately following a flood event, as damage caused after a qualifying event may not be covered by insurance. Check on your neighbors, especially those that are elderly and those with disabilities. Boston Water & Sewer Commission (BWSC) is cleaning out low-lying areas of debris that could clog catch basins and restrict the flow of water through underground systems. Boston Police Department (BPD) is prepared to institute barriers in areas that will be most affected by flooding, and redirect traffic as needed. Public Works Department (PWD) will have loaders available to remove debris. Several city departments, including BWSC, BPD, Fire, EMS and 311 will have extra support available to assist. The Office of Emergency Management (OEM) will activate the City’s Emergency Operations Center which will be staffed with City departments to coordinate response operations. The City is currently pursuing a Climate Ready project in South Boston that is analyzing the current and future flood risks to the neighborhood, with the input and feedback from residents, businesses, landowners and developers. Next week the City is hosting a community open house to share conceptual designs of flooding solutions. The event will be held on Tuesday, March 6 from 6:00 – 8:00 p.m. at the Children’s Museum. Climate Ready Boston is the City’s initiative to develop resilient solutions to prepare Boston for rising sea levels, extreme heat and increased weather events. Climate Ready Boston is aligned with Imagine Boston 2030, Go Boston 2030, Resilient Boston, and other planning initiatives to ensure that climate adaptation supports the Mayor’s goals for economic growth and social equity across the city. Climate Ready Boston is led by the City of Boston in partnership with the Green Ribbon Commission and with support from the Massachusetts Office of Coastal Zone Management and the Barr Foundation.